After a string of financially challenging years, Mission Support giving at Elvira Zion Lutheran Church in Clinton, Iowa, dropped to 10 percent of its budget. That’s higher than the ELCA average of 5.6 percent, but less than half of what the congregation once gave. Jealaine Marple, pastor, had always spoken enthusiastically about Mission Support, the undesignated funds congregations share with their synods, which synods then share with churchwide ministries. Though Marple encouraged leaders to increase their giving, she was astonished at the congregation’s annual meeting in 2016 when financial secretary Linda Duesing moved to restore Mission Support to the historical level—22 percent. Marple recalls supporting the idea, listing various ministries funded by these offerings. “I said the money that we send does so much good and does so much ministry in the world that it would be hard not to give,” she said. Believing 22 percent to be too high an increase, the congregation voted to raise Mission Support giving to 15 percent. Elvira Zion’s experience isn’t unusual. Many congregations with tight budgets struggle to provide the level of support that ELCA ministries need to accomplish God’s work. Yet, the more that congregations understand the vital role of Mission Support, the more they want to give, said Nick Kiger, associate director of Mission Support. When he visits congregations, Kiger explains how Mission Support funds the ministries they rely on, such as recruiting and training new rostered ministers or how synods accompany congregations in times of crisis or pastoral transition. “I’m always surprised when people say back to me, ‘I didn’t know we did all that! I didn’t know that was what Mission Support does!’ ” he said. Synodical ministries are especially dependent on Mission Support, which typically accounts for between 85 and 98 percent of a synod’s budget, he said. For the churchwide organization, Mission Support funds about 65 percent of operating costs, which includes funding for various ministries. The Mission Support team, led by director Victoria Flood and Kiger, has been working hard with the 65 synods to communicate that Mission Support is the lifeblood of our interdependent denomination: Congregations share Mission Support dollars with their synods, and the synods then share it with the churchwide organization.These funds flow back to ELCA members, congregations, institutions and global companions through churchwide and synodical ministries. Today congregational Mission Support averages 5.6 percent, which is down from over 10 percent when the ELCA was first formed, Flood said. Many Lutherans embrace 10 percent—a tithe—as a benchmark for faithful giving. 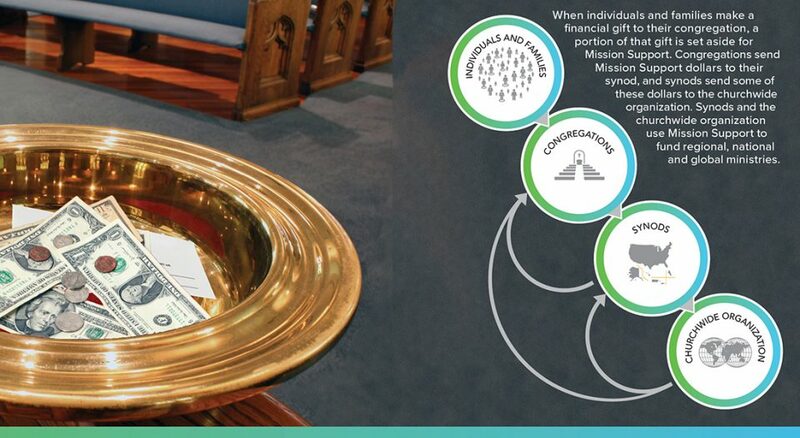 For congregations that set a goal of tithing their offerings in Mission Support, Flood suggests building up to 10 percent through small percentage increases over time. For many congregations that give 10 percent or more, it’s a matter of pride and dedication to supporting the wider church. Messiah Lutheran Church, Red Lodge, Mont., confronted a one-year drop in giving when six generous families moved away. But even with a tight budget, they agreed to maintain Mission Support at 11 percent, said Kim Wilker, pastor. Serving a congregation that is experiencing financial challenges, Wilker understands the temptation some may have to cut this support to balance the budget, but he advises leaders to think carefully and prayerfully. “Our congregation could have done that this year, easily, but they chose not to because they value the relationship and see the importance of the institution,” he said. In explaining the significance of Mission Support, Flood finds a valuable teaching tool in Presiding Bishop Elizabeth Eaton’s four emphases for the ELCA: We are church. We are Lutheran. We are church together. We are church for the sake of the world. For Marple, Mission Support is an extension of Christ’s “Great Commission” to go and make disciples of all nations (Matthew 28:19-20). It’s true that evangelism and discipleship happen when Jesus’ followers are guided by the Spirit, but financial resources help. “At the end of the day, it’s going to take money,” she said. Elvira Zion’s members believe in Mission Support in part because they are always learning how they are actively living out this church’s mission to serve God’s people. For instance, youth share their experiences at ELCA Youth Gatherings, voting members share what they learn at synod assemblies, and Marple shares ELCA happenings. Duesing, who has been a member for more than 30 years, was pleased her congregation voted to raise Mission Support because she understands how much good it does. “Every dollar is important,” she said. Stories of Faith in Action highlights how Mission Support dollars advance ELCA ministries that are transforming lives with the gospel of Jesus Christ. To download a free PDF and associated videos or order free copies (you cover shipping), go to elca.org/SOFIA. Maybe we should say, “God’s work. Our hands … and our money!” Church is not and should not be all about money, and yet financial resources are necessary to accomplish the important work God calls us to do in our communities, our nation and the world. Mission Support that flows from congregations to synods and to our churchwide organization funds the ministries we all value so highly.